The start of the fall term always brings a rash of bed bug reports from college campuses. 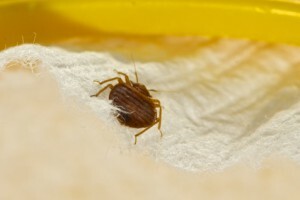 Often students are forced to endure nightly bites from blood-eating bed bugs until housing authorities can arrange for professional bed bug extermination. Frustrated college students ask what they can do to protect themselves while they wait. We’d like to pass along instructions for a simple do-it-yourself bed bug barrier that we received from colleagues Robert Hayden of Phoenix Pest Control and Dr. Gale Ridge of the Connecticut Agricultural Experiment Station in New Haven. The barrier can be made from common household supplies and may also be of interest to apartment dwellers who have to wait for building managers to arrange bed bug extermination. Use this simple barrier to protect yourself from bed bug bites until the professionals arrive. Use tin foil baking pans or plastic jar lids. Pour a very thin layer of cooking, salad or baby oil into the bottom of the container. Soapy water can also be used as bed bugs cannot swim. Place one container under each leg of your bed. Unable to climb in the slippery oil, bed bugs looking for a meal will become trapped and drown. Flush dead bed bugs in the morning. Stern Environmental also sells bed bug barriers and other bed bug protection products. Call Stern for expert bed bug extermination. Controlling bed bugs is a difficult task. Bed bugs have evolved over the years and have become resistant to many of the pesticides that once were able to kill them. Pest control professionals are always on the hunt for new and exciting equipment and devices that promise huge results when it comes to bed bug control and elimination. Stern Environmental Group has just the solution that pest control professionals from coast to coast are looking for…the Verifi Bed Bug Monitor. In past years, hotels, motels, apartments, and other multi-unit buildings did not provide bed bug treatment until it was reported by residents. In most cases, the delay caused the bed bugs to spread from room to room until the infestation was out-of-control. There are many different monitoring devices available on the market. Some have had promising results, some have had limited success. The Verifi Bed Bug Monitor is touted as an “intelligent device” in that it is able to lure bed bugs and trap them in the device so that pest control professionals will be able to find an infestation at the early stages. The Verifi Bed Bug Monitor has a lure that mimics the CO2 that humans emit while sleeping. Bed bugs are then attracted to the lure and once at the device, they quickly fall inside of the pitfall area where they are unable to escape. The lure provides 90 days of continuous active bed bug monitoring which can be replaced once the 90 days are complete. 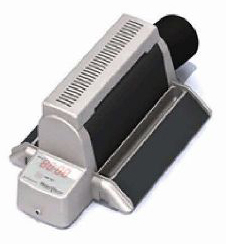 This innovative bed bug monitoring and trapping device is available in our online store. Please visit our website for more useful bed bug tips and resources. Watch Out Bed Bugs, The NightWatch Is Here! NJ pest control professionals agree that bed bugs are a formidable enemy in the pest control world. Bed bugs are known for the elusive behavior and their ability to hide in all types of cracks and crevices. Add in the fact that despite their hunger pangs, bed bugs can abstain from receiving a blood meal for up to 18 months. Bed bugs can be difficult to harness in hotel rooms, apartments, or rental homes that are not occupied. When bed bug powders or spray treatments are left in an unoccupied room, there is no incentive for a bed bug to come out for a blood meal. The NightWatch Bed Bug Monitor and Trap is the perfect aid to hoteliers, apartment owners, colleges, cruise ships, and pest control companies. The NightWatch can be used to monitor units above, below, or adjacent to rooms that have had an active bed bug infestation and have undergone bed bug treatments. Using the NightWatch will help ensure that bed bugs have not traveled through the walls seeking harborage in neighboring units. Hospitals will even benefit from this incredible technology as they will be able to keep their patients safe from bed bug bites with minimal disruption. Bed bugs are attracted to heat and CO2. The NightWatch Bed Bug Monitor and Trap works by mimicking the lure that humans create for bed bugs. Once attracted to the unit, the bed bugs are trapped in the pitfall device until they are disposed of. It should be noted that you must purchase the CO2 at your local hardware store as federal shipping regulations no longer allow shipping of CO2 containers. Visit our online store for more information about the innovative NightWatch Bed Bug Monitor and Trap.